Plot thickens: Hasan Ali Khan. Mumbai: A case involving alleged money laundering to the extent of $8 billion has taken several fresh twists with one of the partners of the main accused, Pune stud-farm owner Hasan Ali Khan, claiming his innocence; the investigating agency looking to initiate action against Khan and another of his alleged accomplices, a well-connected Kolkata businessman; and talk of penalties as high as $6 billion. This week, a Mumbai court will hear the case of Khan’s alleged accomplice Philip Anandraj, a Switzerland-based hotelier, who is asking for his passport back. And likely, his reputation, too. In a new development in the investigation of Khan, accused of stashing $8 billion in his Swiss bank accounts and money laundering, Anandraj has moved a Mumbai court against the Enforcement Directorate (ED), the government agency that investigates economic crimes. ED claims to have in its possession conclusive evidence to prove Anandraj’s association with Khan. The court will hear the case this week. “We have found that Khan has given the power of attorney to operate his five lockers with Barclays Bank Plc. in UK to Anandraj," a top ED official in Mumbai, who spoke on condition of anonymity, said in an interview with Mint. “ED is in talks with the UK government to get details of these lockers." Anandraj has denied any involvement in the case, and says he wants his passport, seized by the agency, back. Asked for comment, Anandraj’s advocate P. Janardhan said: “I am not allowed to speak on this since the case is pending in the court." ED says investigations have revealed that Anandraj was assisting Khan and his family to obtain Swiss citizenship and a work permit, but efforts fell apart midway as Indian authorities launched an investigation last year. The same ED official also told Mint that another close partner of Khan, Kolkata-based industrialist Kashinath Tapuriah, has been reluctant to cooperate with the agency, which is slowing the investigation of the intricate multinational trail of money transfers from Khan’s international accounts. “Tapuriah knows everything but is not cooperating with our investigations and not revealing relevant information," said the official. “Every time we approach him, he falls sick." When asked for comment by Mint, Tapuriah sent a text message, saying: “I would have been happy to talk to you but unfortunately (I have) been quite unwell for last few months and doctors have advised me rest." The agency has recorded Tapuriah’s statement, but the information is “insufficient for investigation", said the official. According to people familiar with the development, the agency is in the process of issuing a show-cause notice to Khan and Tapuriah under the Foreign Exchange Management Act, or FEMA, asking them to give reasons why they should not be penalized. The penalty on Khan could be as much as $6 billion. In June, ED officials met Tapuriah, the former owner of Incab Industries Ltd and brother of the late Priyamvada Birla, who ran the MP Birla Group after M.P. Birla’s death. 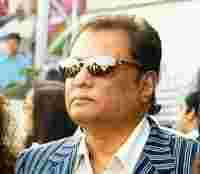 So far, 17 foreign bank accounts of Khan and his associates, including Tapuriah and his wife, Chandrika Tapuriah, face an ED enquiry. However, the agency has transaction details of only four international bank accounts. Besides Anandraj’s passport, the agency is also holding the passports of Khan, his wife Rheema, and Tapuriah. “We have not been able to attach Khan’s property in India because they are in his wife’s name," said the same ED official. “However, the income-tax department can attach the property of Khan’s wife because she had not been filing her returns." Earlier in February, Mumbai police booked Khan for holding three fake passports. Following this, Khan filed an anticipatory bail application in the Bombay high court, but it was rejected. On 30 April, a Mumbai court declared Khan a proclaimed offender after he failed to turn up. Since then, the Mumbai police have not been able to trace Khan. Mint reported in a 2 February article that ED claimed to have found $8 billion in the Swiss bank accounts of Khan. ED also said it had evidence of a $300 million transfer to him, via a Chase Manhattan Bank account in New York, from billionaire Saudi arms dealer Adnan Khashoggi.